The love triangle between Blac Chyna, Tyga and Kylie Jenner is as complicated as they come, but over the last few months, the three of them appear to have been working hard at putting their differences aside for two reasons: Rob Kardashian and Chyna are engaged and expecting a baby next month and Chyna and Tyga share a son, King Cairo — so, for the sake of their child, they no doubt want to be as civil toward each other as possible. While things have been pretty drama-free recently, that may have changed because of one simple thing: a birthday party. You might remember that last week Tyga and Jenner threw an amazing Ferrari-themed birthday bash for the rapper’s son, but according to a new report, Chyna was not happy about it. A source close to Chyna reportedly told TMZ that she believes the extravagant party (which was initially her idea) was fed to the couple by a production staffer on her reality TV show, Rob & Chyna. The source states that Chyna had planned her own version of the Ferrari-themed party (which was held last Saturday) for two months, and she made sure to invite both Jenner and Tyga to the celebration. However, Jenner and Tyga reportedly chose not to come to Chyna’s bash, and threw a bigger copycat party the following day. Whoa. If these reports are true, then you really have to feel for Chyna. She’s a doting mom, and it must have been hard to have someone try to put one up on her after she put in all that work to make her son’s 4th birthday party unique and special. Of course, we don’t have all the details, and the second party could have been a complete coincidence, right? 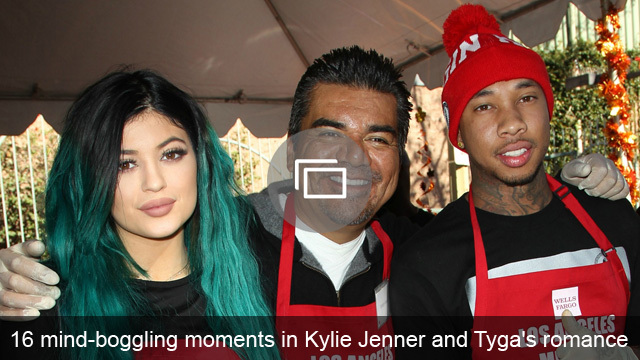 That said, it’s really unfortunate that the relationship between Chyna, Tyga and Jenner appears to be tense once again (at least for the time being) because they were making such great progress. Are you surprised that it was a birthday party that created more tension in this already complicated relationship? Share your thoughts in the comments below.